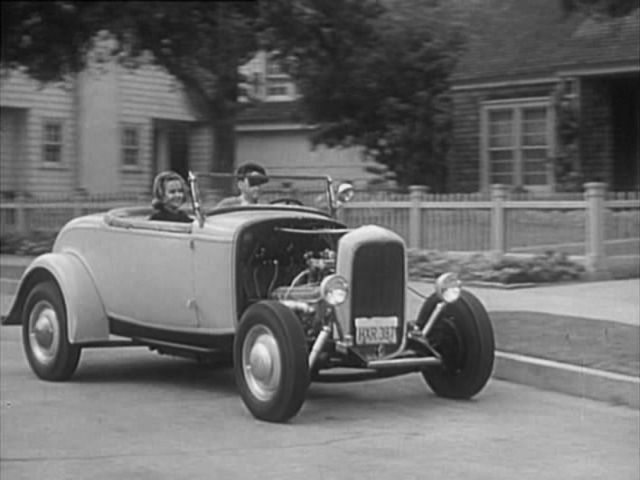 IMCDb.org: 1932 Ford V8 Roadster Hot Rod  in "The Donna Reed Show, 1958-1966"
1932 V8 roadster with a later Chevrolet V8. Scotty Simpson's car--played by actor Jimmy Hawkins (and was one of Mary's several "regular" boyfriends). Hawkins later went on to star with Shelley in two of her Elvis movies ("Girl Happy" and "Spinout"). However, he also knew Donna Reed before most on the show...as when he was little he was one of the Bailey children in Donna Reed's famous Christmas movie "It's a Wonderful Life", with Jimmy Stewart.